CraftShare 2011 is into a whole new week: Tasty Treats. And kicking things off is a very special guest, Meaghan, of the decorated cookie, who is an Author, Edible Crafts Expert and Maker of Tasty Things. Today she's sharing her cookie decorating skills with a colorful & tasty project. Take it away Meaghan! Hi everybody, and thank you Cheryl, for letting me visit and participate in CraftShare 2011! 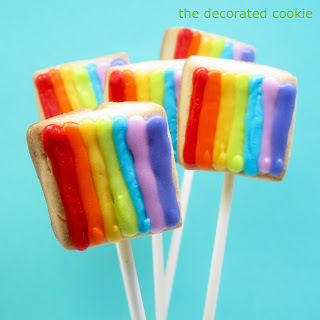 While I make all kinds of sweet treats at the decorated cookie--marshmallows, cake pops, cupcakes--I'm sticking with my usual "tasty treats": cookie pops. 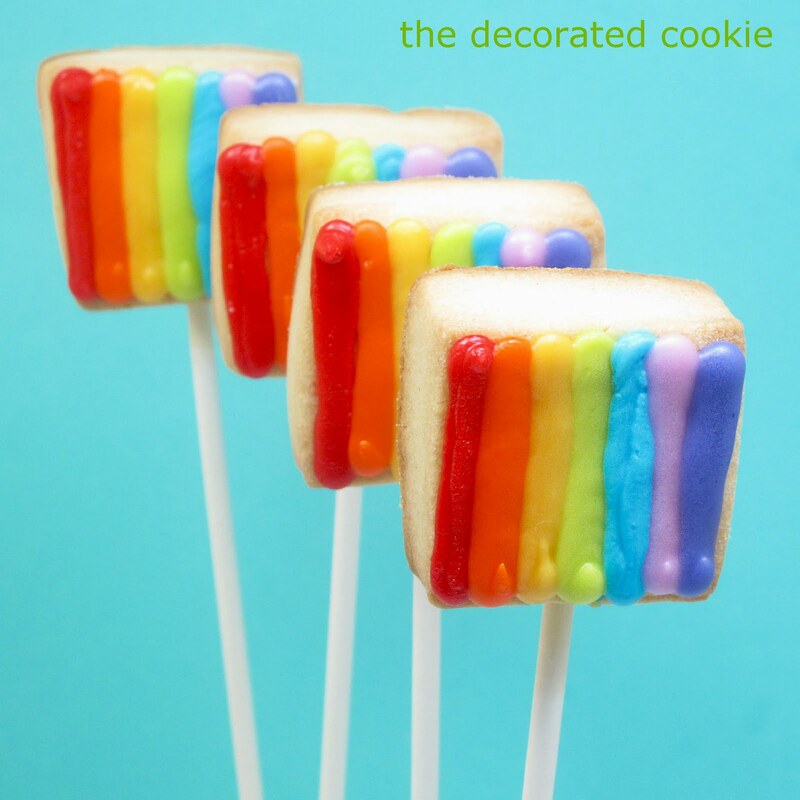 These square rainbow cookie pops are very easy to make and decorate. *Find the cookie or fondant cutter, lollipop sticks, decorating bags, couplers and tips at the craft store. You'll need one bag, coupler and tip for each color you choose. For food coloring, I suggest Americolor soft gel pastes. Red Red, Orange, Egg Yellow, Electric Green, Sky Blue, Electric Purple and Regal Purple used here. Prepare cookie dough, chill, roll out, cut out squares, insert lollipop sticks and bake according to the recipe. Let cool completely. Prepare royal icing according to the recipe. 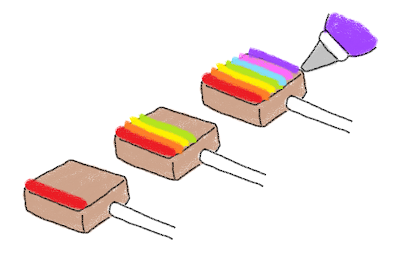 Divide and tint your rainbow colors. I made red, orange, yellow, lime green, blue, purple and indigo. Prepare decorating bags with couplers and tips, fill with each color, and close tightly with rubber bands. Pipe stripes with each color. That's it! Let dry overnight before handling. TIP: You may want to trace the square cookie cutter on a piece of parchment paper and practice piping the lines first to make sure you space your lines correctly across the cookie. Now you've got colorful, yummy treats to brighten everyone's day. Thanks for sharing this tasty treat tutorial Meaghan! 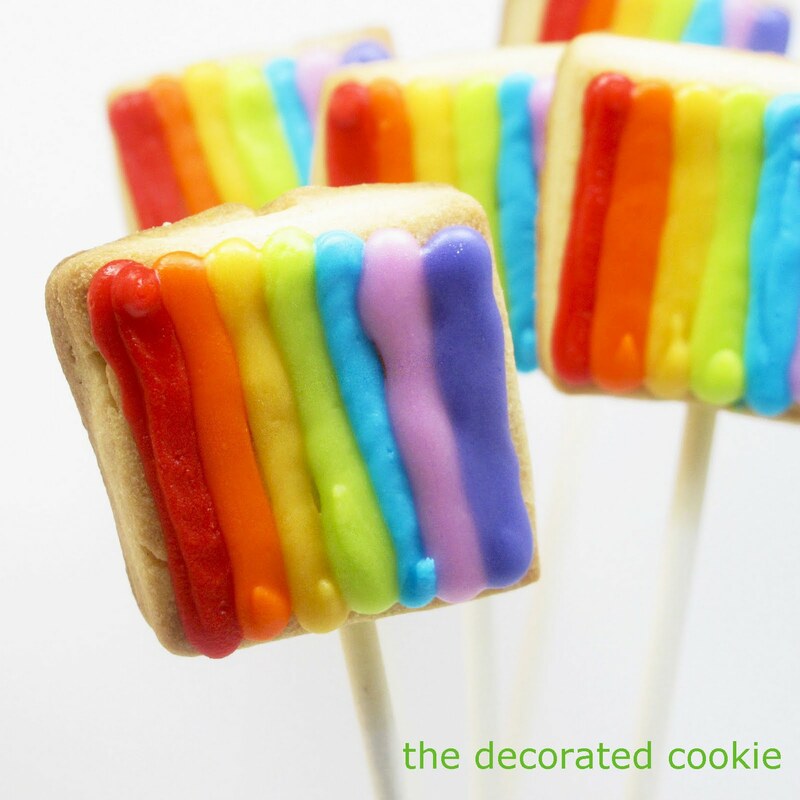 Got a favorite cookie or decorating tip of your own? Share it in the comments below! These are perfect for a rainbow themed kids party or a GAY pride rally! LOVE IT! !